I am listening to I Fagiolini’s recording of a 1612 Italian Vespers, having been inspired by their recording of Striggio’s Mass in 40 Parts (blogged about here). It is a fitting choice of music for this topic of the elusive goal that is common prayer or common worship, uniformity of liturgy. From what I can tell, this vision of a truly united, ‘uniform’, common liturgy arose in western Christianity at some point in the Carolingian world. This makes sense to me. Charlemagne, self-styled emperor of Rome, wanted to unite his far-flung realms, not just as Francia but as Christendom. Since they all believed the same (Nicene-Chalcedonian-Dyoethelite-Iconodule-non-Pelagian-anti-Priscillianist), since they were all united once again under one emperor and one law, why should they not worship the same way? The tale, were it to be told well, would be an exciting journey of ups and downs, twists and turns. Of popes saying that filioque is a bad thing. Then popes changing their minds. Of the Benedictine office being regularised, and of Benedictine monasticism being instituted throughout the Frankish realms. Of saints’ days proliferating. Of new liturgies composed — St. Thomas Becket, Corpus Christi. A good writer could make what was really a slow, ponderous reality a breathless race from Charlemagne to Trent. But I am no G K Chesterton, who would probably have been the man for that job. Nevertheless, the liturgy would go off and do its own interesting things with occasional bits of papal intervention to help keep it on track until Trent. The result was not exactly uniformity of worship, not quite common worship to a very great extent. True, most localities used a version of the Roman Rite which, when stripped of a few later mediaeval additions, was still essentially what we find in the Gregorian Sacramentary (700s) or the Bobbio Missal (c. 700) (see the Catholic Encyclopedia and Edith M Humphrey’s new book on worship, Grand Entrance); an example is the famous use of Sarum, very popular in England in the later Middle Ages and at the time of the Reformation. Sarum, whilst very largely ‘Gregorian’, was still a local variant, if not as localised as the Ambrosian Rite of Milan. I do not believe that the western mediaeval quest for uniformity was ever close to being achieved before the Council of Trent. And I have no doubt that it was not fully achieved after Trent. The Council of Trent was the Catholic Church’s great reforming council of the 16th century, a successor to Pope Innocent III’s reforming council of the 1200s and not really a predecessor of Vatican II at all by way of content. Both Trent and Vatican II reformed liturgy, but the type of reform at Trent was a much more traditionalising reform. The Gregorian Mass (or, as Western Rite Orthodox call it, the Divine Liturgy of St Gregory the Great) was stripped of certain ‘accretions’ and made to look much more like the mass visible in the Carolingian and other early mediaeval sacramentaries and missals. With the power of the printing press, the reforming popes of Trent were able to disseminate the new ‘Tridentine’ mass and liturgy of the hours (breviary) throughout western Europe. Trent also saw the emergence of the imprimatur (visible to this day in the front matter of many Catholic publications) upon religious books, thus helping regularise Catholic doctrine and worship throughout western Europe as never before. A friend once remarked that the Catholic Church per se did not exist before Trent; he was speaking doctrinally, of course — but he could have spoken liturgically as well. But 16th-century liturgical reforms were not restricted to the Catholics of the continent. Most famously amongst those of my ilk were the two editions of the Book of Common Prayer by Thomas Cranmer of 1549 and 1552, as well as the Elizabethan Book of Common Prayer after the brief resurgence of the Latin Sarum under Queen Mary I. Through not only the printing press but government legislation, such as the Act of Uniformity, the Church of England was able to regularise and make more uniform than before the liturgy of her people. The BCP services as represented on the 1549-1662 axis are among the most beautiful expressions of western liturgy ever composed. 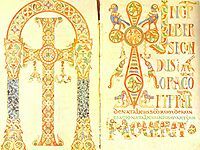 They draw upon the Scriptures, especially the Psalms, as well as the Use of Sarum, the Gelasian Sacramentary, the Divine Liturgy of John Chrysostom, and continental Protestant liturgies (with a nod to Martin Bucer). As an expression of the English language, the Book of Common Prayer may be unsurpassed in its beauty, rivalled only by its near-contemporaries — Shakespeare and the King James Version of the Bible. As an expression of English Protestant theology — a theology at once unafraid of its mediaeval heritage and of the need for reform — it stands as a testimony of balance, truth, and piety. For a time, the BCP reigned supreme amongst Anglicans, Trent amongst Catholics. The beginning of the end was 1872, when Anglicanism gave in to the pressures of Tractarianism and modified the format of its regular Sunday morning service. Things sped up in 1904 with a concern that modern people have different needs than those of 1549-1662. And all hell broke loose upon our liturgies in the 1960s, not only amongst Anglicans, but amongst our Catholic brethren as well. Today, we have as many Prayer Books as there are English-speaking nations. We have Common Worship and The Book of Alternative Services and The Scottish Liturgy of 1982. We have parishes and dioceses creating their own idiosyncratic versions and visions of liturgy, such that you may be treated to a service with an ‘alternative creed’ in one context, and a service with no proper ‘canon’ of the Mass — that is, no proper prayer of consecration — in another. You can pray at home not only with any of a variety of BCPs and official texts, but also very lovely unofficial ones, such as Celebrating Common Prayer from The Society of Saint Francis (online here), or Celtic Daily Prayer from the Northumbria Community (online here). Or, if you are perversely retrogressive, you can use a Tridentine Latin Breviary like me (except for in springtime — my second-hand set came missing Verna, and I can’t afford the ones on offer at abebooks). Common prayer, common worship, liturgical uniformity, was a dream sought by us in the West for several long centuries, and almost achieved in some places for a few short ones. But it is gone. Since I dislike Common Worship, the Book of Alternative Services, The Scottish Liturgy of 1982, and the American Prayer Book of 1978, I miss it — although I never lived with it. 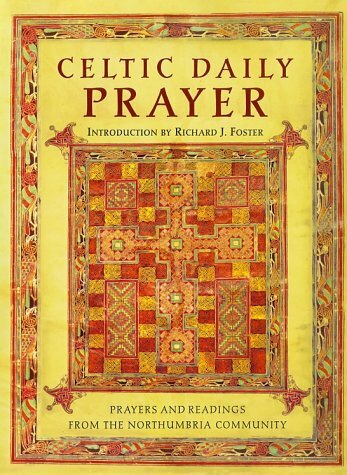 But I have appreciated Celebrating Common Prayer and Celtic Daily Prayer. I enjoy my Tridentine breviary. And the smorgasbord of liturgies both for private and for corporate prayer and worship is only growing. Just as some modern worship music is coming to maturity musically, poetically, and theologically, I hope that modern liturgy can do the same. The Prymer: The Prayer Book of the Medieval Era. Robert E Webber has taken the layperson’s shorter Book of Hours so common in the High and Later Middle Ages and produced a useable, readable book out of it. For those unafraid of praying (or skipping) prayers to the BVM. 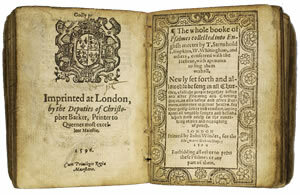 The Private Devotions of Lancelot Andrewes. Not exactly new, I know. But these are worth praying by any Christian of interested mind. A couple of editions/translations exist. Keep your eyes open; my copy came from a library booksale. The Daily Office West. This blog is updated daily; no need to flip around to get your Collect and Epistle in line! Finally, for those unafraid of the East, there are prayers for morning and evening in the Orthodox Study Bible. Remember, of course, that these recommendations come from a man who prays in Latin and is enamoured with 1662.